Posted by admin in Mayon, Philippines, Saturday volcano art, volcano art, volcano culture. The painter Fernando Amorsolo (1892-1972) was a dominant figure in the visual arts of the Philippines during the decades before the Second World War and into the post-war period. His oeuvre is characterized by scenes of the Filipino countryside, harmoniously composed and richly coloured, saturated with bright sunlight and populated by beautiful, happy people: it is an art of beauty, contentment, peace and plenty – which perhaps explains its enduring popularity in the Philippines to this day. Amorsolo was committed to two fundamental ideas in his art: first, a classical notion of idealism, in which artistic truth was found through harmony, balance and beauty, and second a conservative concept of Filipino national character as rooted in rural communities and the cycles of village life. The two come together in pastoral scenes such as ‘Planting Rice with Mayon Volcano’, painted in 1949. Here, happy Filipino villagers in their bright clothes and straw hats work together amid a green and sunlit landscape of plenty. Behind them, releasing a peaceful plume of steam, rises the beautifully symmetrical cone of Mayon stratovolcano. It is the ash erupted by the volcano over its highly-active history that has made the surrounding landscape fertile, and the tranquil cone appears here to be a beneficial spirit of the earth standing guardian over the villagers and their crops. Mayon’s eruptions can be very destructive (as in the violent eruption of 1947, not long before this picture was painted, when pyroclastic flows and lahars brought widespread destruction and fatalities) but here the relationship between the volcano and the surrounding landscape is depicted as a positive, fruitful and harmonious one. Mayon is a celebrated symbol of the Philippines, and its presence in Amorsolo’s painting emphasizes his wish to represent the spirit of the nation on canvas. 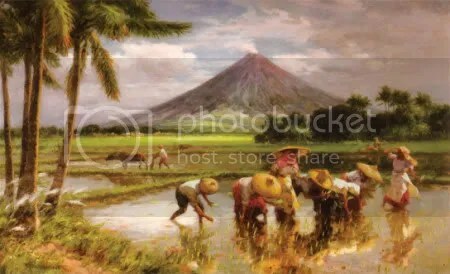 ‘Planting Rice with Mayon Volcano’ is in the collection of the Metropolitan Museum of Manila.